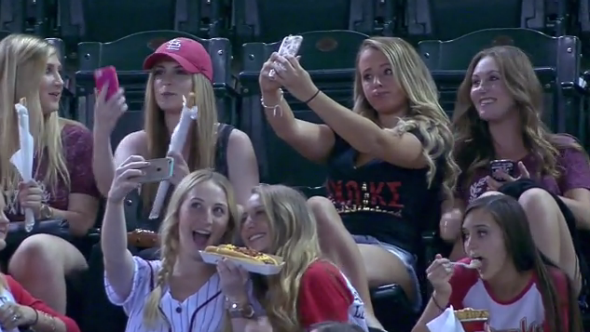 Arizona State sorority girls take selfies at a Diamondbacks game. Arizona State sorority members take selfies at a Diamondbacks game. Wednesday a group of Arizona State University students attended an Arizona Diamondbacks game and taught us all a powerful lesson. It was the bottom of the fourth inning, the Arizona Diamondbacks were down one run to the Colorado Rockies, and as a Diamondback prepared to bunt, a television camera roved the stands in search of a more interesting visual. Because the students were young white women with long, bleached hair and the kind of sports apparel that is specially cut “for her,” the camera chose them. Two Diamondbacks broadcasters urged fans to take photos of themselves and submit them for consideration in the T-Mobile Data Strong® Fan of the Game competition. The students complied. They held out their arms and turned their cellphone cameras on themselves. One student positioned a churro next to her mouth. Snap. Another stuck out her tongue. Snap. A third sucked in her cheeks. Snap. “Look at the one on the right,” one Diamondbacks announcer said. “Do you have to make faces when you take selfies?” asked a second Diamondbacks announcer. “Wait, one more now,” said the first. The camera cut to the baseball game for three seconds, then returned to the stands. The camera cut to the baseball game for five seconds—base hit—then returned to the stands. What have we learned today? Men like to look at young women. Young women like to look at themselves. Men don’t like it when young women look at themselves. But they don’t dislike it enough to stop looking at them when they’re looking at themselves.